Below is a summary of highlights and images from my experience…. Most of us arrived during the day and after spending a few hours at the hostel getting to know each other, we visited the Musicboard Berlin headquarters at Silent Green, Kulturquartier where we were introduced to the Pop-Kultur team, representatives of the Goethe-Institut and some of the mentors for our upcoming programs. Beer was aplenty and although tired from the travel, the excitement was infinite. We began our day going back to Silent Green where we gave a short introduction of who we were, played some of our music for each other. This was a good way to get to know each other and marvel at the diversity of the group. 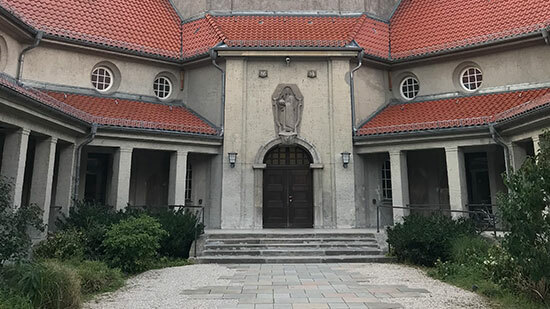 After a quick lunch, we visited Alte Münze, an old mint which has now been transformed into a space for artists and creative entrepreneurs and companies. Alexander Krüger was our gracious host and gave us a tour of the space. From underground basements for raves to creative space-saving offices, it had it all. There was a digital exhibition next door, 90s Berlin, and we did a quick tour. In the evening, we visited Wassermusik 2018: Goodbye UK- And Thank You for the Music at Haus der Kulturen der Welt and attended a reading/talk by Anthony Joseph, Tina K. Ramnarie, Mykeall Riley and Jacqueline Springer on Lord Kitchenerʼs (Aldywn Roberts) contributions to popularising calypso in Britain and the Caribbean communityʼs influence on music, from jazz to ska and bass as we know today. This was probably one of my favourite days of the program. 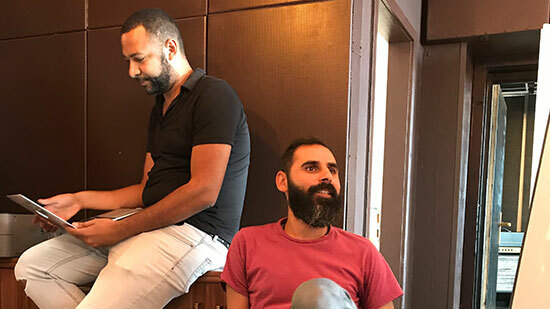 5 of us visited White Camel Studio and under the guidance of Mark Minhasov, Yair Zehavi and Nnamdi Umi we spent our time jamming and recording a track. This was a unique experience because all of us were so different musically and came from such diverse backgrounds. You would think that itʼd be disastrous to put five random strangers together and let them do as they please with all the equipment possible available, but it resulted in a beautiful collaboration. Mark, as a producer, was brilliant in capturing everybodyʼs vibe and comfort zones and helped us create something truly unique. High off the energy of our fruitful day at the studio, we headed to Club der Visionaire at night where Lukas Drevenstedt of Clubcommission gave us a tour of different clubs in Berlin. This, again, was a truly unique experience. 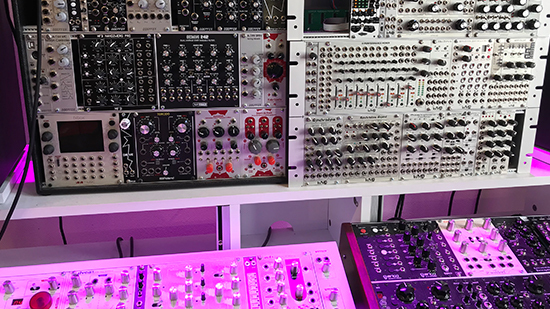 All my life Iʼve heard of Berlin being a mecca for electronic music and now I understand why. Experiencing dance culture till the wee hours of the morning was hands down one of the most liberating experiences of my life. 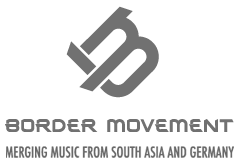 This is something, that I, personally would love to see in India some day in the future: people letting go of all inhibitions and submitting themselves to music just to dance. Itʼs a high no drug can ever quite emulate! Understandably day 4 started a little late for us. One of my favourite things to do as a musician is to visit music stores wherever we go and though not part of the program, a bunch of us spent our afternoon marvelling at gear in music stores in Berlin such as Just Music and Pulse Percussion (highly recommend, the place is a goldmine for little things such as thumb pianos, xylophones and various Asian and African percussion instruments). In the evening we headed to Musikbrauerei for Digital In Berlinʼs ‘10 Years in Sound Festivalʼ where we were treated to showcases by Erik Skodvin, Balago, Laura Cannell, Auf, Rian Treanor and my personal favourite, Ercklentz, Neumann and Suzuki who premiered as a trio. 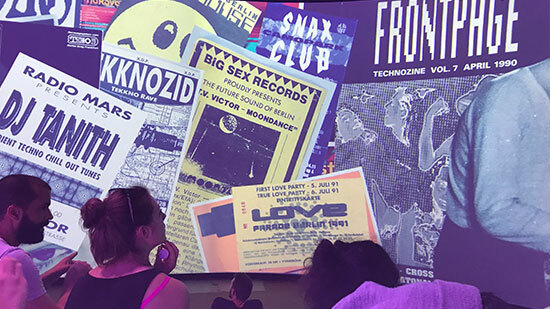 The Digital In Berlin Festival was particularly important as it was the first time I personally experienced music that was so avant garde and yet so soulful. At one point, I remember sitting on the floor and being so overwhelmed with emotion that I had tears in my eyes. I guess the experience will stay with me for a long time because it reminded me of how powerful a force music really can be. We went back to the hostel tired and yet strangely rejuvenated. This was our only free day and we made the most of it by attending the Sunday flea market at Mauerpark. For many of us this was our maiden trip to Berlin so while some decided to take the day off to relax, we did all the touristy things such as museums, art galleries etc. Another wonderful part of the program was the day dedicated to individual internships. My mentor was Berlin-based musician Francesco Wilking and I spent my day at his studio learning basic skills such as how to properly mic instruments to editing and mixing a track. Although it all sounds very formal, we took breaks in between where I was taught a lot of tips and tricks to up my own production game. 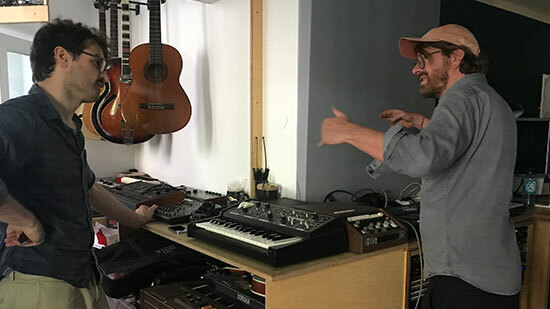 I sat in on Francesco working on a music title for a television series and it was interesting to learn his process, which, turns out is similar to mine – only infinitely more organised. This was our last day before the Pop-Kultur Nachwuchs started; our day started with a trip to Musicpool Berlinʼs office. 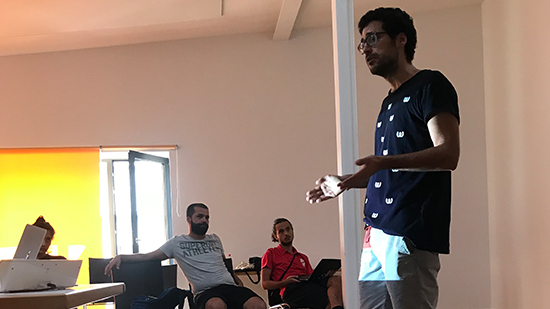 This was fruitful because many of the fellows are looking to eventually move to Berlin and Musicpool offers consultancy on various things and also organises get togethers for artists. 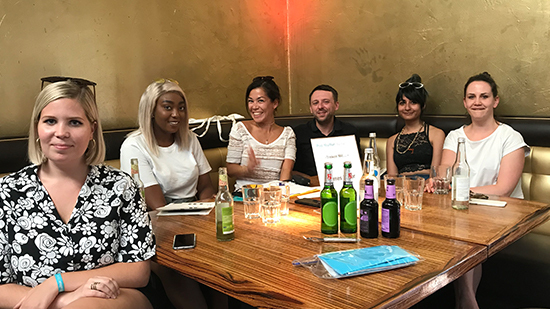 Andrea Goetzke gave us insight on how the industry operates and some pointers on how to connect and sustain oneself in Berlin. 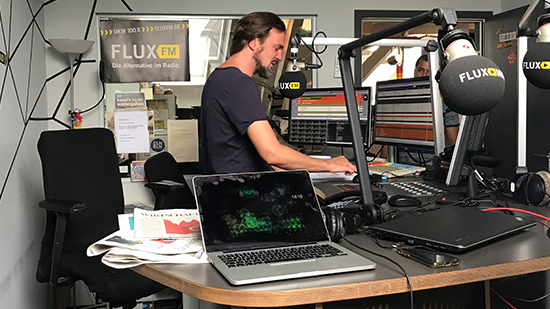 Next up was a visit to the Flux FM radio stationwhere we were given a tour of the floor and also crashed an ongoing program to promote our showcases at the Pop Kultur festival. 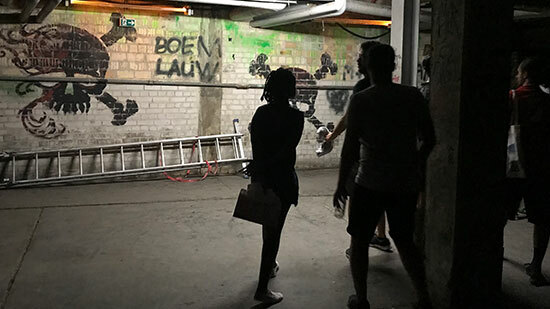 The same building houses the famous Riverside Studios Berlin and we made an unexpected stop and marvelled at the beautiful rooms and had a chat with some of the residents there on the projects they were working on. With the sun about to set, we were in the mood to unwind and our next destination was a boat ride along the city. There was music, there was barbecue and there was endless banter. Even though there were two days still left, this felt like a grand finale to our adventures in Berlin. 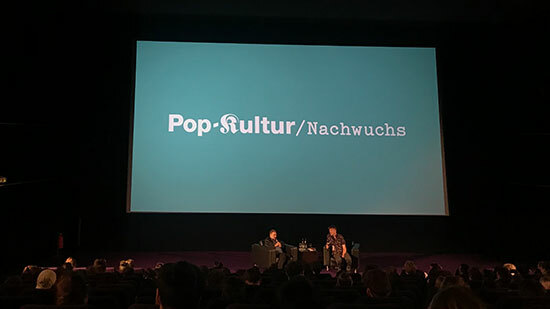 We registered ourselves for the Pop-Kultur Nachwuchs workshops and headed to the introductory talk by Irmin Schmidt (CAN) in conversation with Christian Morin. Up next, I attended a talk on ‘Collecting Society GVL: How To Monetise Your Neighbouring Rightsʼ by Dirk LoÅNwenberg of GVL. This was interesting for me because royalty is still at a nascent stage in India and itʼs important to understand how the system works in different countries. I then attended another talk by Hamburg based songwriter Ilgen-Nur Borali on the concept of DIY and writing and performing oneʼs own music. A short lunch break later, I had a long workshop with Chad Matheny of BIMM called ‘Against Weaponised Soundʼ, which dived deep into acoustics, sound and hearing. As evening set, I geared up for my performance as Plastic Parvati at the Nachwuchs stage later at night, which was also the closing act of the evening. 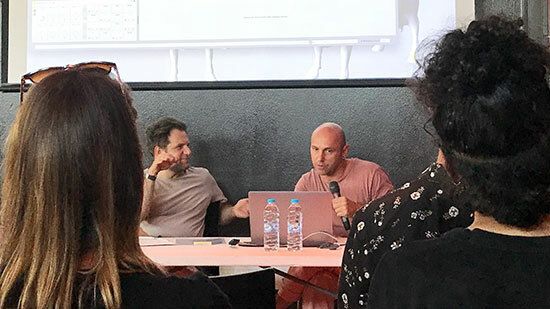 On the second day of the Nachwuchs workshops, the morning began with a talk by Vivien Goldman in conversation with the festival curator Martin Hossbach. Up next was an interactive session with Stuart Swezey on ‘From Subcultures to The Music Documentaryʼ where he showed us clips of his new documentary ‘Desolation Center’ and the importance of music documentaries for pop culture. Some of us also played some of of our work over the years and it felt like a truly global experience. Post lunch I attended another interactive session with Henrik Schwartz, who gave us insiders access to the technicalities of his process and his methods. He let us pick his brain on simple things such as how he uses Ableton for his live sets to more complex, personalised queries. In the evening, once the workshops were over, we explored the various acts at the festivals. I also got to sit in on a panel organised by Border Movement with Andi Teichmann, Anika Henderson and Natasha Humera Ejaz in conversation with Sarah Elizabeth Chawla on the importance of artistic residencies, how it helps one grow and some of the consequences of DIY cultural collaborations. On my last day in Berlin, I was privileged to attend a small interactive session with James Minor of SXSW on how to pitch yourself at a music showcase to booking agents and promoters. Our final official activity was a farewell dinner with Julia Gajewski, who not only organised the entire program but helped us in every step of the way right from our visa application process to giving us tips and information on how to get around in Berlin, what to do etc. As I write this, weeks later, I canʼt help but feel grateful to the Goethe-Institut and everybody who was a part of it. Iʼve returned to Calcutta with a renewed vigour in music making and along the way Iʼve found 9 very special people from different parts of the world who feel like family to me now. I think every musicians/producer/DJ/whatever you identify as, should apply for the program because this will change you and give you a wholly new perspective on not just music, but life. 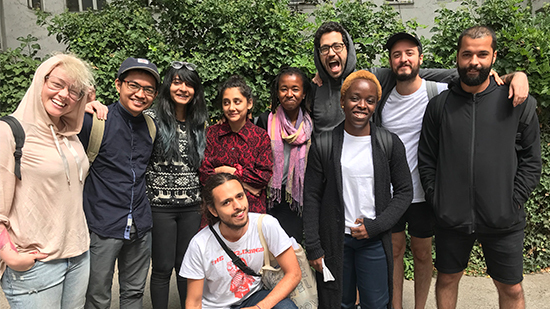 The other Goethe Talents this year were: Amine Benali (Tunisia); Larissa ‘Labaq’ Nalini (Brazil); Benke Texeira (Brazil); Juan Carlos Torres Alonso (Columbia); Joyce Olong (Nigeria); Adelle Nqeto (South Africa); Samer Etienne El Chami (Lebanon); Tesla Manaf (Indonesia) and Irina Giri (Nepal). Although our time together was very short, I feel like I found a family in them and they have inspired me to aspire to be not just a better musician, but a more wholesome human being.